Kansas City Chiefs running back Kareem Hunt (27) on the sidelines during a NFL game between the Kansas City Chiefs and the Los Angeles Rams on Nov. 19, 2018 at the Los Angeles Memorial Coliseum in Los Angeles, CA. 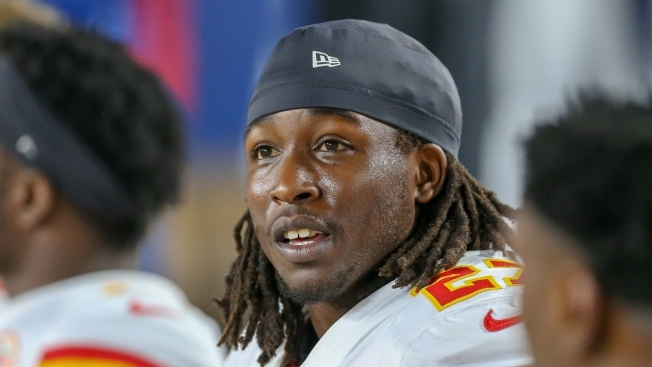 Chiefs running back Kareem Hunt was released from the team Friday night after video surfaced of the reigning NFL rushing champion knocking over and kicking a woman in a Cleveland hotel hallway in February. The team issued a formal statement Friday night in which they confirmed that they are "releasing Kareem immediately." "Earlier this year, we were made aware of an incident involving running back Kareem Hunt. At that time, the National Football League and law enforcement initiated investigations into the issue. As part of our internal discussions with Kareem, several members of our management team spoke directly to him. Kareem was not truthful in those discussions. The video released today confirms that fact." Police were called to the scene during the Feb. 10 incident, but no charges were filed. The video posted by TMZ comes at a sensitive time for the Chiefs and the NFL when it comes to domestic violence. Hunt was at the Chiefs' facility earlier Friday in preparation for Sunday's trip to Oakland, but was excused and sent home, a person with knowledge of the situation told The Associated Press.